South of the Sinaloan state capital city of Culiacan there is a place famous for its ostentatious mausoleums that resemble small homes. They are built for a kind of Sinaloan Pharoah: Drug Kingpins. 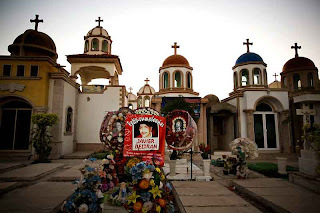 The Jardines del Humaya cemetary is the final resting place for the who's who of Mexican Organized Crime. Old time kingpins who fell in a hail of police or enemy bullets mixed with the noveau narcos who suffered the same fate. 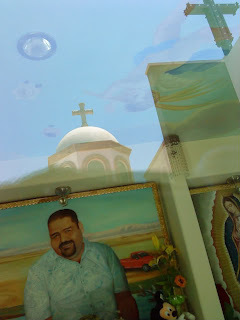 1970's drug boss Lamberto Quintero Paez, immortalized in Corridos and movies is buried here in a modest glass and concrete crypt. His picture outside the glass doors is surrounded by AR-15 shell casings. Ex Sinaloa Cartel kingpin Baltazar Diaz Vega who was shot to death by police in Mexico City in 1994 and also praised in the famous corrido "Se Les Pelo Baltazar" is also buried here, his picture showing him in a stetson and riding his beloved horse. Gilberto "El Chapo" Caro Rodriguez, who died in a hail of bullets and grenade blasts in May 1992 also lies nearby, near his aviator nephew Onofre Landell, who was also killed with him. Gonzalo "Chalo" Araujo; the wife and children of Hector Palma Salazar "El Guero and Arturo Beltran Leyva "El Barbas" also lie here, in Jardines del Humaya. Old time kingpin Jose Ines Calderon Quintero, killed in a 1988 shootout with Federales, and his compadre Ramon Beltran lie side by side in adjacent crypts. The desceased mafiosos are often buried in mausoleums made of fine stone, some being 2 stories high. One is a minature replica of the Culiacan cathedral. Some cost up to $100,000 dollars. They have Air Conditioning, lighting, music systems, so that friends and family can enjoy visiting their departed loved ones. Life sized portraits adorn many crypts, showing smiling men holding AK-47s or showing their shiny new pick up or SUV in the background. Its not rare to hear Norteno trios singing songs and corridos or a Sinaloense banda playing music on the birthday of a fallen narco. Mysterious unsmiling men mill about the cemetary, noting who comes and who goes. But not everyone who rests here is a narco. Manuel J. Clouthier, PAN presidential candidate in 1988 and Sinaloa native also lays here in Jardines del Humaya. He died in a 1989 car crash. 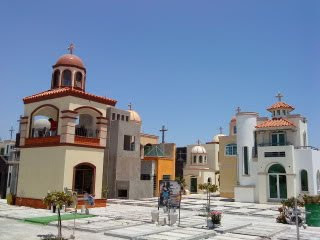 All in Culiacan's Valley of the Kings, the final resting place for many of Sinaloa's Good Ol' Boys.